Some 95% of teens 12-17 use the internet, according to a survey of 799 teens conducted by the Pew Research Center’s Internet & American Life Project between April 19 and July 14, 2011. In that study, the teens were asked about a number of online behaviors and the results for video-oriented activities are reported here. 37% of online teens have video chat conversations with others. Nearly 2 in 5 online teens (37%) say they have video chatted with someone else using applications such as Skype, iChat or Googletalk. Girls are more likely than boys to video chat. Online girls are more likely to report video chatting than boys, with 42% of girls who use the internet saying they have video chatted compared with about a third (33%) of boys. Teenagers of different ages are equally likely to video chat. Some 34% of online 12-13 year olds use video chat, as do 39% of 14-17 year olds. The differences by age are not statistically significant. 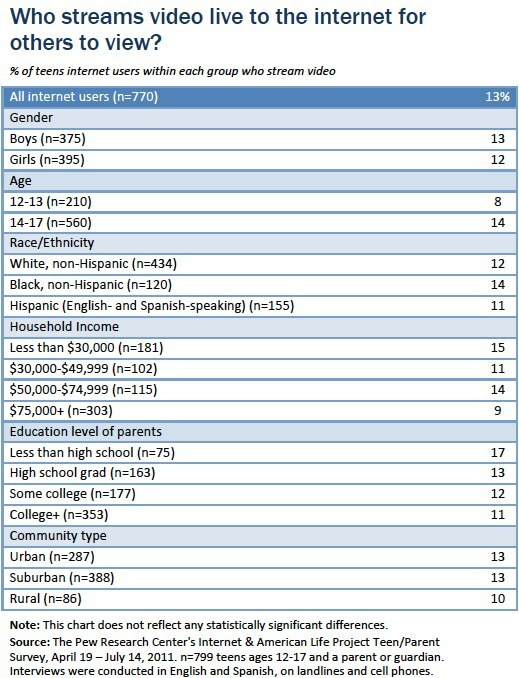 White teens who use the internet are more likely to report video chatting than online Latino teens; 41% of white teens do so, as do 28% of Latino youth. There are no statistically significant differences between online black youth and either white or Latino youth in video chatting. Youth from higher income and higher education families are more likely to video chat than youth from lower income and education households. Online teens from families with the lowest levels of parental education – where a parent has not received a high school diploma – are much less likely than others to video chat with just 14% of teens in those families video chatting, compared with 40% of teens with parents with higher levels of education. In a similar vein, teen internet users from higher income families are more likely to video chat than lower income teens. Of online teens from families earning $75,000 or more annually, 46% use video chat, while 32% of online teens from families earning under $50,000 annually use these services. Frequent internet users, texters and social media users are all more likely to video chat than others. Some 43% of daily internet users video chat, compared with 31% of weekly users and 1% of those who use the internet less often. Our survey found that 77% of all teens ages 12-17 have cell phones and 97% of cell users (or 75% of all teens) can send and receive texts. Teens who text are also more likely to use video chatting, with 40% of texting teens chatting compared with 27% of non-texters. Other social media communicators also show similar patterns. 27% of teen internet users record and upload video to the internet; older teens are more likely to record and upload videos. In our most recent data collection, older teens 14-17 are more likely to record and upload video than their younger counter parts, with 30% of online older teens saying they record and share videos, compared with 21% of 12-13 year olds. In a change since 2006, boys and girls are equally likely to record and upload videos. Nearly equal shares of online boys (28%) and girls (26%) say they shoot and share video. In 2006, online boys were nearly twice as likely as online girls to report uploading video they had taken, with 19% of boys and 10% of girls reporting the activity. Social media using teens are more likely to shoot and share video. Social network site users – who make up 80% of internet using teens – are more likely to record and upload video than teens who do not use social media. Broadly, 31% of social network site users record and upload videos, compared with 10% of teens who do not use social networks. Similarly, one third (33%) of Facebook users take and share video, compared with 11% of teens who do not use Facebook. 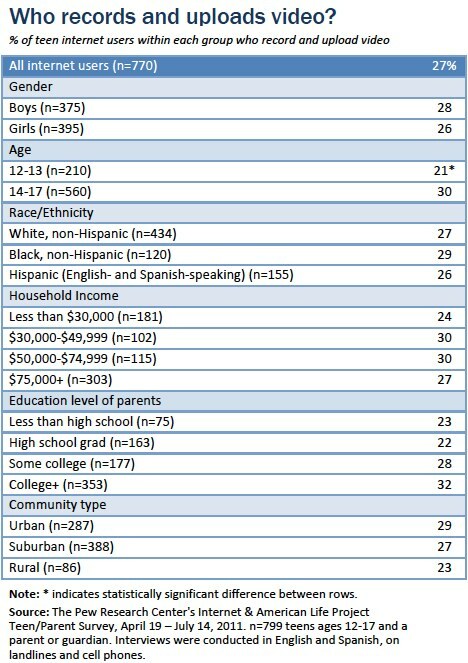 Overall, 16% of teens use Twitter. 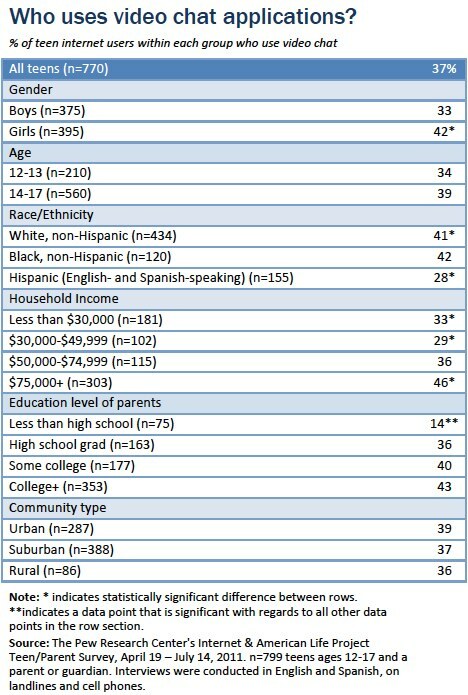 Of them, 46% record and upload video, compared with 24% of teens who do not use Twitter. Those teens who use social network sites more frequently are also more likely to take and share video – 37% of daily social media users take and post videos, as do 24% of weekly social network users, and 17% of those who visit social sites less often than weekly. There are no differences in recording and uploading video by race, ethnicity or socio-economic status. 13% of online teens stream video live to the internet for others to watch. Home broadband users are more likely to stream video live than dial-up users. Fewer teens stream live video to the internet for others to watch than engage in simple uploading – just 13% of teen internet users say they stream video live online. There are few demographic differences in video streaming. Boys and girls (13% of boys and 12% of girls) are equally likely to do it, as are younger and older teens. Frequent internet users – those who go online daily – are more likely to stream video than those who go online weekly (16% of daily users, compared with 7% of weekly users). Teens with home broadband connectivity are also more likely to stream video live for others to view. While 14% of broadband users stream, just 3% of those with dial-up connectivity do so. Social media users are more likely to stream video than others. As with other video sharing activities, social media users are more likely to report streaming video. Some 14% of teens who use social network sites stream video, compared with 5% of teen internet users who are not social network users. Similarly, 15% of Facebook users say they stream video, compared with 6% of teens who do not use Facebook. And once again, Twitter users are the most likely to report streaming video, with one-quarter of users of the service reporting streaming, compared with 10% of teens who do not use Twitter. Frequency of social network use also plays a role; 17% of daily social media users stream, compared with 5% of teens who use social media less than weekly. Other choices that teens make about their online privacy do not relate to their likelihood of streaming video. The private or public nature of a teen’s social media profile does not make a difference in their likelihood of streaming video – there is no statistically significant difference among teens with private, semi-private or public profiles.